My first real understanding of the conservative obsession with the personal destruction of Hillary Rodham Clinton came in Des Moines, on the eve of the 2016 Iowa caucuses. 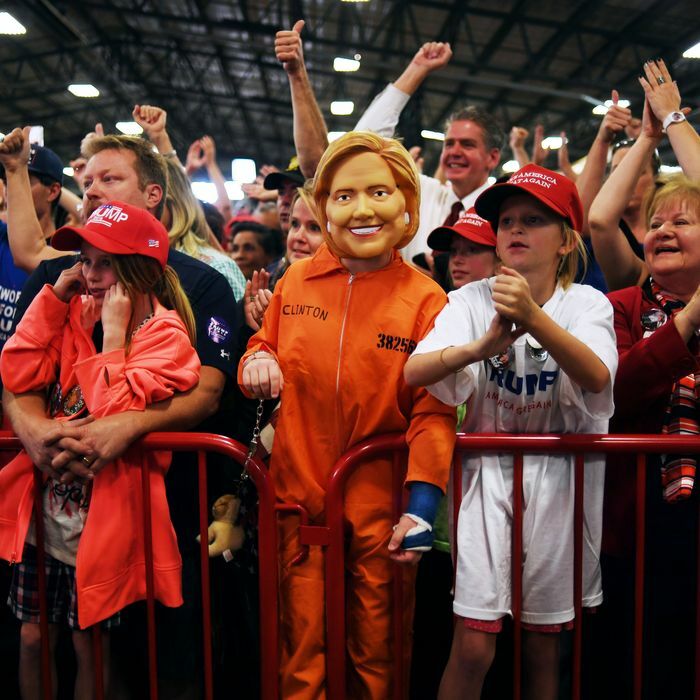 At a Ted Cruz rally I noticed about half the attendees wearing pins that read “Hillary for Prison,” featuring a cartoon depiction of the former secretary of State behind bars. By the time Donald Trump won the nomination to face Clinton in the general election, the rank-and-file Republican hate frenzy toward this relatively conventional center-left Democrat metastasized to become a major feature of campaign rallies, with “Lock Her Up” chants providing a steady drumbeat to the GOP candidate’s own bombastic attacks on his opponent. After Trump won his unlikely election victory and Clinton largely receded from public view, claims from his supporters that she, not Trump, deserved to be investigated by the FBI and the Justice Department regularly arose alongside every new allegation of malfeasance by the president or his campaign. Right on through the midterm elections, every time Trump mentioned his former opponent at public events the same old “Lock Her Up” cries quickly emerged. In a Monday press conference on Capitol Hill, the South Carolina senator — one of the president’s staunchest allies in Congress — declared that his next move is going after Democrats and the Department of Justice over “what happened” to Trump. Graham laid out a laundry list of questions and grievances that have been stewing on the right since the 2016 election: How did the FBI go about spying on Carter Page, a Trump campaign associate with links to Russia? What was the deal with Bill Clinton meeting with Barack Obama’s attorney general, Loretta Lynch, on an airport tarmac? How did the infamous “dossier” compiled by hired British spy Christopher Steele come to be? What about Hillary Clinton’s emails? All of these questions, Graham said, will be at the top of the agenda for the powerful Senate Judiciary Committee, which he chairs. It is a well-known tactic, particularly among modern-day Democratic political operatives, to accuse your opponent of committing offenses that you and your team have actually committed. By doing so, you deflect public opinion away from what must not be discovered — your own illegal activities. A number of unanswered questions surround the role then-Secretary of State Hillary Clinton played in handing over 20 percent of America’s uranium supplies to Uranium One, a company entirely owned by the Russian government. To date, no serious investigation has been launched into this highly controversial decision. What, exactly, can a renewed vendetta against HRC accomplish for Trump and the GOP at this point? The kind of people who exult at the thought of Clinton donning an orange jumpsuit and dining on prison fare fall into two categories, neither of whom are 2020 swing voters or people who need motivation to vote: hard-core MAGA people who would follow their brutish warlord to hell and back, or hard-core anti-Clinton progressives who are deeply invested in a post-Clinton, left-trending Democratic Party. A GOP that’s not only backward-looking in longing to bring back the America of the 1950s, but can’t let go of its hatred for a vanquished opponent, is not well-equipped to win an entirely new battle. No wonder conservative media kept buying into idiotic predictions that HRC would run again in 2020. That’s the contest they wanted, and will not get.